Godzilla. IX/8, Beinn Bhàn. Coire Nan Fhamair. Scotland. | Great Escape. Nick Bullock. Godzilla.1X/8. Robertson, Benson, Bullock. 14/3/11. Beinn Bhàn. Coire Nan Fhamair. Applecross. Guy Robertson’s zeal travelled across the airways and bellowed from my mobile phone, which I was now holding at a reasonable distance from my ear. He continued in some broad Scottish blather that I didn’t understand but I did catch, Godfather, Applecross, new direct, and raving English fairy. I could say the opportunity to eventually climb on Bein Bhàn was what pushed me into the eleven hours of behind the wheel, but it wasn’t. The warm thought of placing some English blood in the middle of all of that thick testosterone rich Gaelic gop was what eventually did it. Even more, it was the thought of how I would feel should I not go and they nail some great big new route on Bein Bhàn. Yes I’ll admit, FOMO was all of the encouragement I needed to spend £120 in fuel for the round trip and spend two days of driving. Sun-wind-rain, sun-wind-rain, cloud-rain-sleet, snow-whiteout-dark, deer-whiteout-deer, dark-wind-more wind … at last I pulled into the parking spot before the stone bridge at the start of the steep and winding Bealach na Bà road and waited. “Ah, Piglet, how are you? 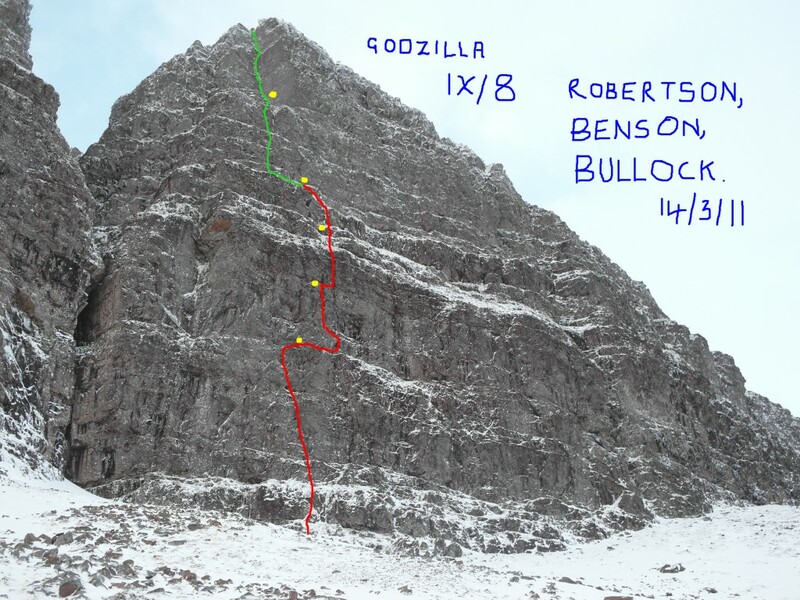 And where is the savour of Scottish winter climbing? At this point the Peugeot passenger door burst open and out into the barren wind-blow emptiness bounced enthusiasm and hope and success, a veritable powerball of Scottish energy that strutted around the dark. And balanced somewhere, just above his pale un-suntanned heed was a halo made of glowing thistle. And in the dark, the halo glowed no-surrender.